The modern use of the word word 'dowry' refers to the durable goods, cash, real or movable property, a transfer of parental property, gifts or money given at the marriage of a daughter. The older more traditional meaning and use was that this was a gift to the bride as her exclusive property. In India due to British manipulation of Hindu Law, it became the price paid by the bride's family to the bridegroom, his parents and even relatives as a condition of the marriage. It is prevalent in many countries but in India it is more obvious and causes great social harm. The current British devised dowry system puts great financial burden on the bride's family and often leads to crimes against women ranging from emotional abuse, injury and sometimes death. The payment of dowry is clearly unjust and is prohibited under Indian law. The dowry system reflects and perpetuates man's superiority over women making a mockery of the very idea of gender equity. But what is the real history of this menace? Was Indian society always oppressive of its women? On one hand we have the ancient scriptures which talk about women with such high respect, our earth, nature, nation, knowledge, wealth, power, energy are all regarded as woman. We hear about Swayamvar in the ancient Indian marriage traditions, where it was the bride who decided whom to marry. There was no Swayamvadhu, the groom could not hold beauty contests to decide which bride to marry. Instead it was the girl who in a Swayamvar, would put all the competing potential bridegrooms to different contests and then select the bridegroom whom she liked. So if this was the importance given to women in our tradition, then when and where did this contradiction of the menace of dowry enter our society? We don’t find any instances of dowry related violence in the literature of ancient times. Not even in the literature belonging to the pre-colonial era of India. So when did the Indian society adopt the evil version of dowry? The system of Dowry existed in India even in pre colonial period, before the British Rule, but not in the format that is prevalent in the society today. In this ancient system of dowry, the parents of the bride, even her kith and kin, all gave wealth to her in the form of valuable gifts etc. It was just like how parents used to give a part of wealth to their sons, so did they give it to their daughters too during the daughter’s marriage. What is very important to be noted here is that, the valuables or the wealth was given to the bride, and NOT to the groom or his family. In other words, the dowry wealth continued to be owned by the wife and not by the husband or his family. This gave the required financial independence to women who would even manage the income from their agricultural land , etc. During the initial days of the British rule, contemporary European writers in 1792 praised the status of Indian women as "enjoying as much as liberty they desire”. It all started with the Permanent Settlement of Bengal in 1793 by the British under Lord Cornwallis. This enabled private ownership of land which was unknown in India till then. Private ownership of land was never practised in India in the past. The land always belonged to the government and people only settled in the land. Very few realize that the Zamindari system of landlords who ill treated peasants was created by the British rule. The massive move which affected the status of the women in the Indian society was the rule imposed by the British who prohibited the women from owning any property at all! And this was what created the menace of dowry system in India. British at that time had not granted their own women property rights, so it reflected their rule in India also. But once the British prohibited women from having any property rights, it meant that all the wealth that a woman got from her parents would be owned by her husband instead. And the moment, this system of husband owning the wealth of his wife was created, the traditional dowry system got converted into a menace creating an institution of greed that oppressed, victimized and suppressed women. 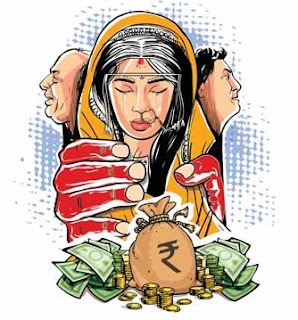 The greed that kicked in created a system where husband and his family started looking at the incoming bride as a source of property and wealth, the male dominated society became greedy, husband and in-laws started demanding more dowry from the bride and her parents. The social harmony and the bonding created by the institution of marriage was gone. Marriage became just another business deal, where making wealth was more easy. Male child became an additional source of income, and female child became a financial burden on the family. This led to the creation of the social problems like female foeticide and an imbalance in male-female ratio in the society, which further led to more crimes on women. After the British prohibited women the right to own or inherit property, until 1956 the women in India did not have the right to inherit property from their parents. It was only in 1956 that the Personal laws were amended giving the right to women to inherit ancestral property. But again those rights were not equal to those of men, married daughters, even those facing marital harassment, had no residential rights in the ancestral home. It was only as recently as in 2005, when the laws were amended again, providing women equal status with men in terms of ancestral property. The British based on their divide and rule policy created different laws for different religions. Prior to that the laws in India varied based on geography, and not based on religion or caste of the person. Successive governments in independent India have retained most of the laws we inherited from the British without much amendments. Hence today unfortunately, personal laws are different in India depending on which religion the person belongs to. « What Defines a Hindu?